In most companies – especially B2B firms – sales and marketing don’t get along. Ultimately, both groups are tasked with the same revenue production goal, but their core skills and perceptions are different enough that much is lost in translation. 87% of the terms sales and marketing use to describe each other are negative. And really, the whole construct doesn’t make a lot of sense. It’s a historical relic of a bygone age. If you were a space alien and were sent to Earth to observe the human race via how we buy and sell goods and services, you would be startled to learn that companies have two, separate groups (with different management, tasks, and compensation schemes) that each are charged with generating revenue. WTF? would be your response (or whatever “WTF?” might be in your alien tongue). Aligned sales and marketing teams produce 400% higher annual growth than teams that are unaligned. This is the power of Smarketing: the harmonious alignment of sales and marketing teams. Recently, I delivered a presentation at Cisco’s Marketing Velocity Partner Summit in San Diego about Smarketing, and the 5 critical components of making it work. I’ve embedded a modified version of the slides below, for your perusal and download. The slides have more detail, but here are the five key points in crafting and implementing a Smarketing program in your company. Much of what prevents sales and marketing from working well together is that they don’t really know each other all that well, particularly in larger companies. You need to create mutual understanding by implementing familiarity programs on two levels. Sales Ride Alongs where marketing spends half a day paired up with a sales person, observing actual sales calls. Executive Smarketing sessions monthly, where exec-level leaders meet to plot strategic course. Both groups need to agree on target audiences, personas, customer journey and funnel, and where and how leads get handed off from marketing to sales. Shared language is also critical. If you have a zebra in your office and a group of people insists on calling it a “striped horse” confusion will occur. Just 45% of businesses have a company-wide definition of a sales-ready lead. You also need to have the same reporting system, and marketing needs visiblity throughout the entire process, not just through the initial lead generation. You’ve heard the saying “I know half my marketing dollars are wasted, I just don’t know which half?” If marketing cannot determine – at the specific, program level – what marketing pieces resulted in closed sales and revenue, you can guarantee that they won’t know which half of the budget is wasted. This is couples counseling, but for sales and marketing. Both groups must make promises to one another that cannot be violated. Together, it can be determined the steps and stages necessary for the company to meet its company-wide goals (rather than department-level goals). For example, you must agree on how many total leads are necessary each month by calculating the percentage of leads that are sales-qualified, the percentage of those that close, and the average revenue for new customers. Then, once you have that total lead count determined, marketing becomes accountable to sales to hit that number. For a long, long, long time sales controlled nearly all the information customers needed. 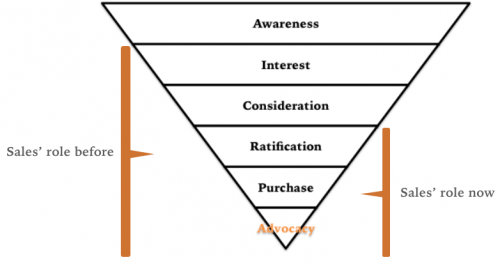 Marketing’s job was to create awareness, and sales did everything else. Today, it’s different. Customers have access to almost all the information they need, for free, online. (This is a huge part of what my book Youtility is about). This self-serve information has disrupted sales’ traditional role so that marketing now handles brand and awareness-building, but marketing ALSO now handles early and mid-funnel consideration via content marketing and similar. And with 70% of B2B marketers planning to create more content than ever this year, that trend won’t be reversing any time soon. So, sales’ role is now the “last mile” of the customer journey. Which means that when a prospect becomes a lead, they are choosing to do so, and sales needs to follow up FAST, and recognize that the customer is likely to be well-educated on the basics. If your information is good enough, you will be allowed to graduate to a conversation with the prospect, but not before then. When a lead is developed as a trusted relationship of a salesperson in social, that lead is 7 times more likely to close. So, marketing must encourage and enable sales to use social media, instead of trying to prevent sales from using these tactics. Marketing must commit to ongoing training and a social media “help desk” that sales people can use to optimize their social media behaviors. One of the problems in business is that it’s too easy and too common to use stories to justify action (or lack of action). Our minds naturally remember and gravitate toward stories (we have a whole podcast series devoted to this concept), so it’s easy to see why this occurs, but it’s a terrible way to make decisions and run a business. That’s an interesting story. How often does it occur? When you respond that way, it instantly reframes the conversation around patterns – a much more accurate way to make Smarketing decisions. 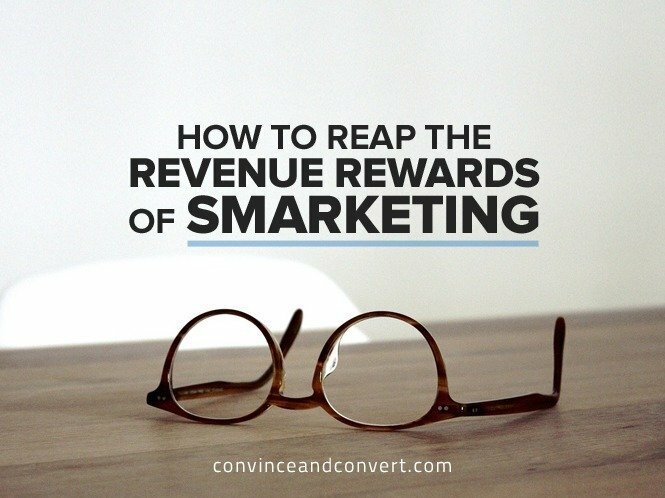 You can put Smarketing into practice in your organization. It’s not easy, but it’s worth it. Remember aligned organizations see a 400% more revenue growth than do non-aligned organizations. Are you ready to get started?